Not only Kuwait but Jordan, Lebanon and Libya have expelled hundreds of thousands of troublesome Palestinians. But the rabid anti semite picks only on Israel. “When is it a sin to disagree with Mahathir?” asked Malaysiakini columnist Francis Paul Siah today. My answer: When the Dearest Leader is now “our beloved Tun” being arselicked to death by the fawning Dapsters. Over the 1980s decade, it was estimated that Kuwait was host to a Palestinian population of 400,000-450,000. 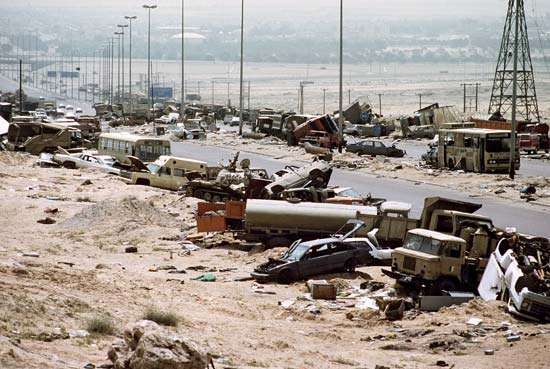 On 2 Aug 1990, Iraq invaded Kuwait and occupied the country for seven months. During the Iraqi occupation of Kuwait, the Palestinian community there together with the PLO had sided with the Iraqi invaders. PLO even cheered Saddam Hussein as “a hero”. Kuwait was liberated in late February 1991 by a coalition of American and other foreign troops following Operation Desert Storm. Following the Persian Gulf War, liberated Kuwaitis saw the Palestinian guests in their country as a fifth column who had collaborated with the Iraqi enemy. – see Middle East Quarterly Fall 2012, pp. 75-83. Also see ‘Kuwait Squeezes Out Palestinians’ (The Christian Science Monitor article, 2 Aug 1991). Some sources quote the figure of 374,000 Palestinians as pushed out of Kuwait between 1991 and 1995 – see The Gulf War: Overreaction & Excessiveness by Hassan A El-Najjar (2001). Munaẓẓamat al-Taḥrīr Filasṭīniyyah or its name in English, Palestine Liberation Organization (PLO), was established in 1964 to represent two million people of the Palestinian diaspora. PLO had bases in Jordan. • The kingdom Jordan was founded in 1949 on what was previously the British-ruled Transjordan which was in turn founded on the earlier Palestinian mandate. • Under the Sykes-Picot Agreement of 1916, the Ottoman empire was dismembered into areas that became modern Syria, Iraq, Lebanon and Palestine. These ‘mandates’ were administered by colonial powers France and Britain. • Sykes-Picot is held up as an example of the contradictory promises made by Britain to both the Arabs and the Zionist movement. • The Balfour Declaration of 1917 is the statement of British support for Zionism and “the establishment in Palestine of a national home for the Jewish people”. Jordan today has within its borders the ancient biblical kingdoms of Moab, Gilead, and Edom. October 1956: Palestinians voted in Jordan’s first free parliamentary election. April 1957: King Ḥussein of Jordan’s ruling Hāshemite dynasty purged the Jordanian legislature of Palestinian extremists after surviving an attempted coup. Post-1967: In the aftermath of war between Israel and its Arab neighbours, Jordan‘s Palestinian population became increasingly hostile to the Hashemite throne. Anarchic Palestinian elements even ambushed the king’s motorcade – twice. September 1970: PLO again attempted to seize power from King Ḥussein, causing the monarch to declare martial law. An estimated 1,000-5,000 people were killed in the fighting between Palestinian guerrillas and the forces of King Ḥussein. July 1971: Jordanian army succeeded in expelling PLO. Jordan had had enough of the problematic Palestinians and did not want them any longer in the country. “Driven from Jordan, the PLO intensified its activities in Lebanon. The presence of more than 235,000 Palestinians was a source of tension and conflict in Lebanon, as it had been in Jordan,” said Encyclopedia Britannica. 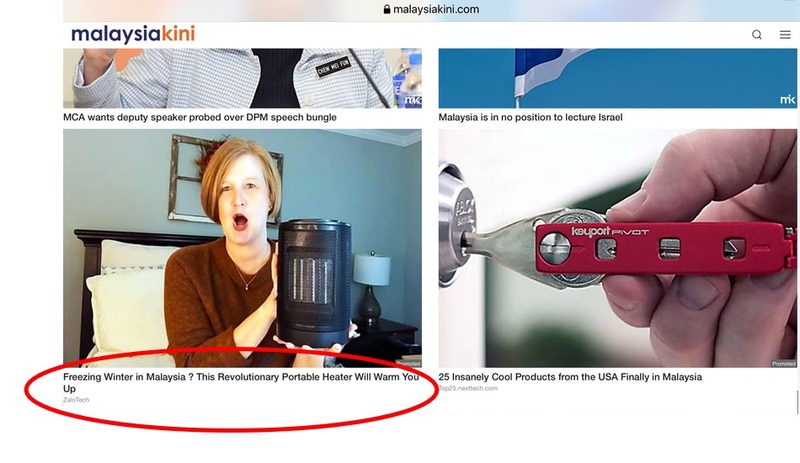 BELOW: Lebanon needed Palestinians as much as Malaysians need the ‘Revolutionary Portable Heater’ to warm us up during our “freezing winter” – see ridiculous Google ad touting heater use in a tropical country … makes no sense! And so PLO shifted its bases to Lebanon. November 1971: Black September, a group formed within PLO’s Fatah, assassinated Jordanian Prime Minister Wasfi al-Tel in retaliation for the Palestinian expulsion from Jordan. From 1975 onwards: The presence of militant Palestinians (fedayeen) in Lebanon was a factor contributing to the country’s civil war, according to Britannica. Palestinians allied with the Lebanese Muslims fighting the Lebanese Christians. The war between followers of the two religions lasted 15 years and killed more than 100,000. 20 Jan 1976: PLO units massacred more than 582 civilians in the Christian village of Damour. June-August 1982: Israeli army laid siege on West Beirut in reprisal for PLO attacks on the Jewish state staged from southern Lebanon, and catalysed by a PLO splinter group’s (Abu Nidal) attempted assassination of Shlomo Argov, an ambassador of Israel to the UK. The Israelis allied with the Lebanese Christians to fight the Lebanese Muslims. 1 Sept 1982: Lebanese Muslims lost the civil war. More than 10,000 Palestinian guerrillas and Palestinian Liberation Army soldiers had to be evacuated from Beirut. 16-17 Sept 1982: Lebanese Christian Phalangist militia massacred Palestinians in the Sabra and Shatilla camps. The mass killing of Palestinians by Lebanese was “a rejection of not only PLO presence but also any Palestinian civilian presence in Lebanon”. After the PLO surrender, its fighters sailed by ship from Beirut to seek refuge in Tunisia and Syria. The Palestinians were as much a security threat to Lebanon as they had been in Jordan. 15 Nov 1988: PLO proclaimed a State of Palestine, a kind of government-in-exile. 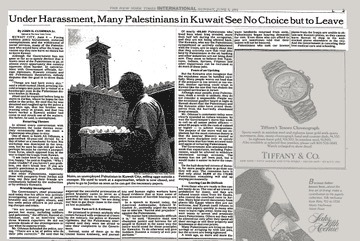 1991: Kuwait expelled most of its Palestinian residents in retaliation for the PLO’s endorsement of the brutal Iraq occupation. 1995: Libya expelled tens of thousands of long-term Palestinian residents from its capital city of Tripoli. The Arabs of Jordan expelled Palestinians. The Arabs of Lebanon expelled Palestinians. The Arabs of Kuwait expelled Palestinians. The Arabs of Libya expelled Palestinians. But the Malaysian premier and his boy minister point their fingers only at the Jews. There is another word for anti semite. It’s called ‘racist’. Entry filed under: #NotMyPM. Tags: “rabidly anti semitic”. Semenyih — acid test on regime change GE15	Can you spot any pig in Malaysia Baru’s CNY deco? “Cherry Picking” is a style of data analysis used when a researcher has inadequate data. … So it is with cherry picking: Data that support the commentary are deliberately selected to endorse that same commentary. I only read this article half way, it’s too long but please do not create hatred between us and our palestinian brothers and sisters. What you wrote were all based on news mostly by the westerners and affected host countries. You were relying on others’ news sources and surely your are not sure yourself of the facts. Whatever PLO was doing not necessarily reflecting the overall palestinian people. Whatever PLO was doing, I am sure was based on political interest. In this circumstances the palestinians became victim. Anyone can write whatever they want / wish just as much as you did. I am on the side of UMNO but when it comes to israel I stand by the palestinians. You were not with the PLO or the palestinians in those days in the first place to write this way, except copying and pasting from the western medias. We muslims knew well how the western medias have done so much damage to our faith by reporting false information. This is how the journalists make a living by selling FITNAH not only on islam but also on other issues and areas. Would you care about the Palestinians if they were not Muslims? Do you care ? I dont think you care be it they are muslims or not. So, you dont deserve to question. By the way about 30% of palestinians are christian if im not mistaken. Quite a huge figure. A expected, Malays will never answer this question. We all know the answer tough, avoiding answering it just confirms the fact. The Christian population is roughly 6% btw, hardly what you would call significant. “Because of that, We decreed upon the Children of Israel that whoever kills a soul unless for a soul or for corruption [done] in the land – it is as if he had slain mankind entirely. So, regardless, be it towards muslims or non-muslims, islam orders us to be just and help towards justice. In palestians and israelis issue, the palestians are the victim and they happen to be muslim majority. As to your question “Would you care about the Palestinians if they were not Muslims ?”, my answer is yes. Even if I can only send a word of support. Because this is what islam has taught. So, if other muslims show couldn’t careless attitude because one party is non muslim ; this attitude does not represent islam. As many people know many muslims misrepresent the true islam. Just so you know, in the case of timor leste and indonesia I am on the side of timor leste even though indonesians are muslim majority. The transgresstion and oppression towards timor leste are unacceptable. Timor leste people are christians, unfortunately no american or christians in other part of the world show their opposition towards indonesia or support timor leste. They only care about what has happened in the middle east. To make things even worse, australia works hand in hand with indonesia to oppress timor leste. Australian christians just don’t care about their timor leste christian brothers and sisters. Should timor leste’s are muslims I would say help from muslims all over the world will pour in unfortunately we have too many oppression issues in the middle east perpetrated by western christians. The life of the hereafter is more important for us but the life in this world is important too because what you do in this world will determine your life in the hereafter.